Ringworm is a common fungal skin infection otherwise known as tinea. Ringworm most commonly affects the skin on the body (tinea corporis), the scalp (tinea capitis), the feet (tinea pedis, or athlete's foot), or the groin (tinea cruris, or jock itch). No. Ringworm is not caused by a worm. 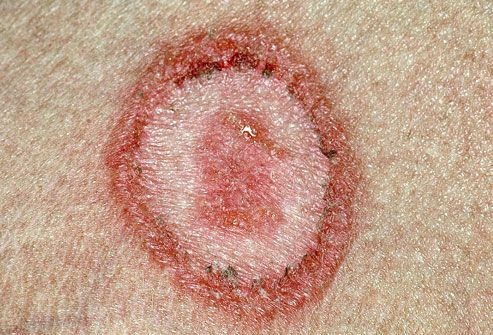 It's a fungal infection that often forms a ring-shaped rash. It can have a red center (seen here) or normal skin tone inside the ring. 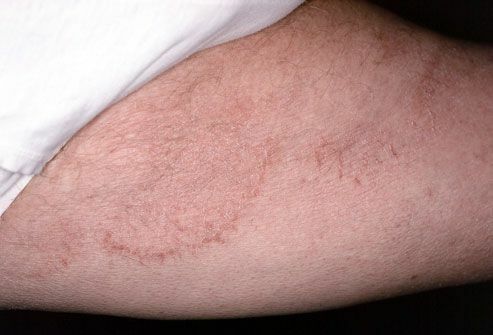 Other rashes can look like ringworm, including spider bites, nummular eczema, and Lyme disease, a more serious infection that produces a bull's-eye shaped rash. These require different treatments, so it's important to consult a medical professional. Certain fungi can help the body, but the dermatophyte types that cause ringworm irritate the skin instead. 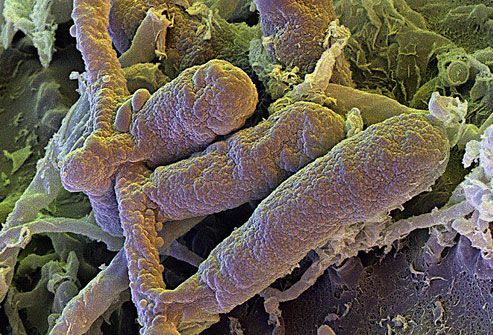 These fungi live off the dead tissues of your skin, hair, and nails. Dermatophytes thrive in warm, moist areas, such as the skin folds of the groin area or between the toes. You’re at greater risk of getting ringworm if you sweat excessively or have minor injuries to your skin, scalp, or nails. There are several types of ringworm (tinea) that can affect different parts of the body. 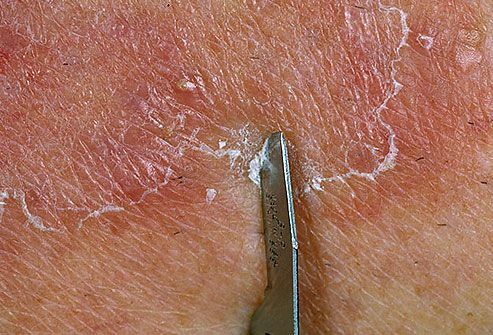 When fungus affects the skin of the body, it often produces itchy, red, raised, scaly patches that may blister and ooze. The patches often have sharply defined edges. They are often redder around the outside with normal skin tone in the center, creating the appearance of a ring. Your skin may also appear unusually dark or light. Ringworm of the scalp commonly affects children in late childhood or adolescence. This condition may spread in schools. 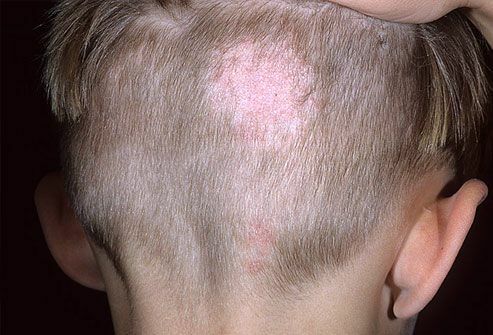 Tinea capitis often appears as patchy, scaling bald spots on the scalp. (Other scalp conditions, such as seborrhea or dandruff, do not cause hair loss). Tinea pedis is an extremely common skin disorder, also known as athlete's foot. This fungal infection may cause scaling and inflammation in the toe webs, especially the one between the fourth and fifth toes. Other symptoms include itching, burning, redness, and stinging on the soles of the feet. Tinea of the groin (jock itch) tends to have a reddish-brown color and may extend from the folds of the groin down onto one or both thighs. Jock itch occurs mostly in adult men and adolescent boys. (Other conditions that can mimic tinea cruris include yeast infections, psoriasis, and intertrigo.) Jock itch may occur due to sweating, hot and humid weather, or friction from wearing tight clothes. Ringworm of the bearded area of the face and neck, with swellings and marked crusting, sometimes causes the hair to break off. In the days when men went to the barber daily for a shave, tinea barbae was called barber's itch. 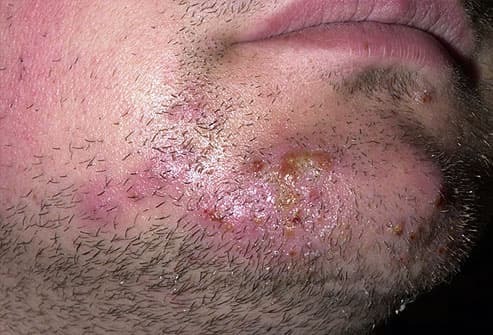 Ringworm on the face outside of the beard area is called tinea faciei. 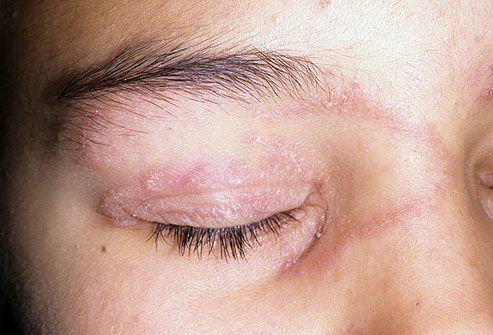 On the face, ringworm is rarely ring-shaped. Characteristically, it causes red, scaly patches with indistinct edges. 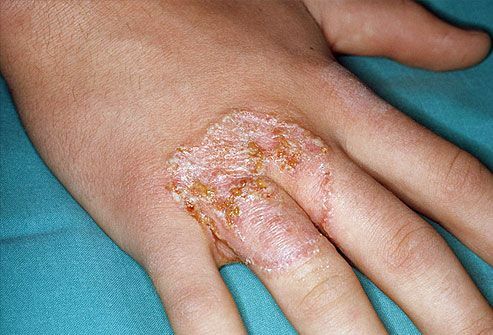 Ringworm may involve the hands, particularly the palms and the spaces between the fingers. 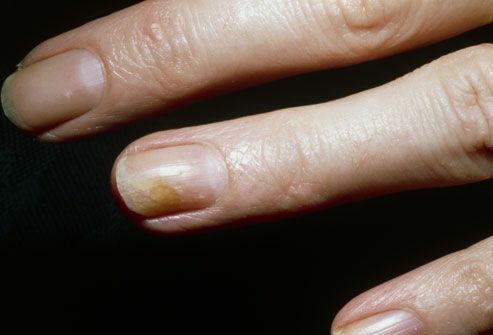 It typically causes thickening (hyperkeratosis) of these areas, often on only one hand. Tinea manuum is a common companion of tinea pedis (ringworm of the feet). Ringworm is the most common fungal infection of the nails, also called onychomycosis. It can make fingernails look white, thick, opaque, and brittle, but more often toenails look yellow, thick, and brittle. Artificial nails increase the risk for tinea unguium as emery boards can carry infection, and water can collect under the artificial nail, creating a moist area for fungal growth. 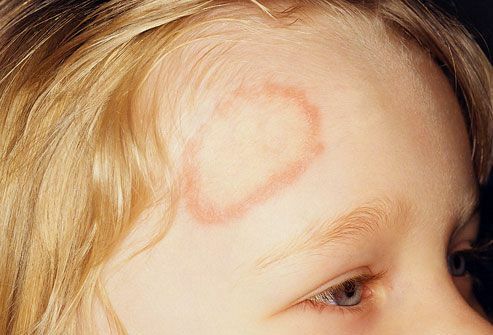 Ringworm is highly contagious and can be spread multiple ways. You can get it from an infected person, animal, object, and even soil. Heat and moisture help fungi grow and thrive, which makes them more common in areas where you sweat. Fungi also grows in skin folds such as those in the groin or between the toes. Ringworm is an example of a zoonotic disease (transmitted from animals to humans). Cats are among the most commonly affected animals. 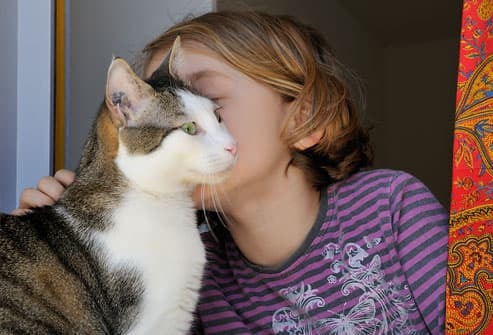 If a cat has ringworm, a person in the house often gets the infection. Dogs, cows, goats, pigs, and horses can also spread ringworm to humans. People catch ringworm from touching the animals, or touching their bedding, grooming items, saddles, carpeting, etc. 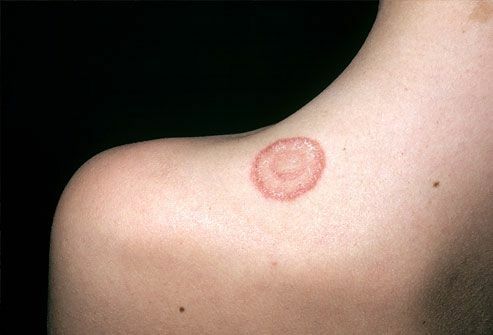 Sometimes, the diagnosis of ringworm is obvious from its location and appearance. Otherwise, doctors can test skin scrapings for tinea fungus. 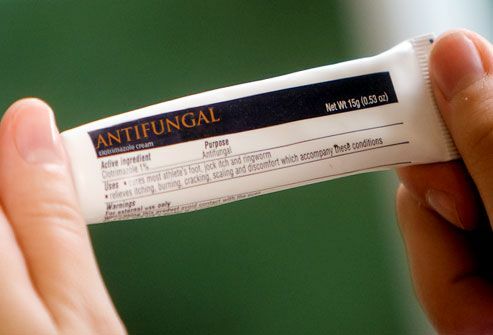 Ringworm can be treated with antifungal creams containing clotrimazole (Cruex, Lotrimin), miconazole (Desenex, Monistat-Derm), ketoconazole (Nizoral), and terbinafine (Lamisil). In cases of severe or resistant infections on the scalp or nails, doctors may prescribe oral medicines such as terbinafine, itraconazole (Sporanox), griseofulvin, fluconazole (Diflucan), ciclopirox, or naftifine. 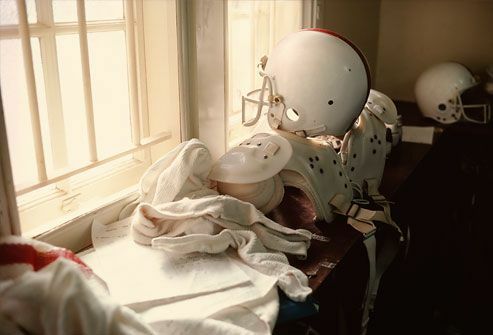 Don't share clothing, sports gear, towels, or sheets. Wear slippers in locker rooms and public pool & bathing areas. Shower after any sport that includes skin-to-skin contact. Keep skin clean and dry. Dry yourself completely after showering. If you have athlete's foot, put your socks on before your underwear to prevent spreading to your groin. (2) Copyright © ISM / Phototake -- All rights reserved. (4) Copyright © ISM / Phototake -- All rights reserved. (6) Credit: Dr. H.C. Robinson / Photo Researchers, Inc.
(7) Copyright © ISM / Phototake -- All rights reserved. (11) Credit: Mike Devlin / Photo Researchers, Inc.